This surgical procedure is used in cases where osteoarthritis has affected only one side of the knee joint. The tibia is cut and re aligned so that pressure is shifted from the damaged side of the joint to the healthier side. An in patient stay of two nights is normally required. Tibial osteotomy is normally performed using a general anaesthetic. First the knee area is cleaned and sterilised. 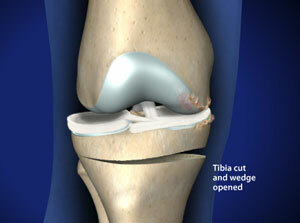 Next, an incision is made on the inner side or front of the knee, to allow access to the knee joint and the tibia. The joint is then examined. In order to re align the tibia, it is cut at an angle and the two sides are separated to create a wedge-shaped opening. The opening is filled with a bone graft, which is secured using a metal plate and screws. This helps hold the wedge in place while it heals. The incision is closed with sutures, the knee bandaged and the leg placed in a splint. Following surgery a knee brace and crutches may be required for up to six weeks and a programme of physical therapy will be advised to strengthen the joint.